A place I truly call home is where I was born and raised, Cebu City: the oldest and most visited city in the Philippines. Crowned the Queen City of the South, Cebu is a dynamic metropolis, looking forward to the future as one of Asia’s prime commercial hubs, and always in touch with a past brimming with so much history. In 1521, Portuguese explorer, Ferdinand Magellan–the man who headed the first expedition that circumnavigated the Earth–first landed on the island in the name of the Spanish crown. Welcomed by chieftain Rajah Humabon and his wife, Queen Juana, his arrival initiated 333 years of Spanish colonization. To mark the beginning of Christianity in the Philippines, he planted a cross on its conquered shore. This miraculous cross, revered by generations of Cebuanos, still stands today encased in ‘tindalo’ wood and housed in a chapel in the heart of downtown Cebu, between the City Hall and Colegio de Santo Niño. It is the city’s most iconic landmark and a symbol of Roman Catholicism in the country. A short walk away, stands the Basilica Minore del Santo Niño, a 16th century Augustinian stone basilica built on the spot where the image of the Holy Child Jesus was found in 1565 by Spanish explorer Miguel Lopez de Legazpi and his men in a burnt wooden box left behind by Magellan as a gift for Queen Juana. 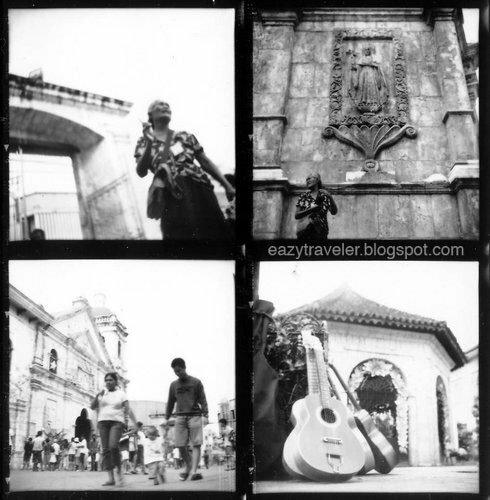 Interesting subjects around this historical complex are the candle vendors who dance and pray to Santo Niño at your request; the roadside booths that sell religious figures and other items; and the guitars, necklaces and souvenirs sold on the sidewalks. There is also a museum with diverse collections within the basilica grounds. The best time to visit Cebu City is during the Sinulog Festival held every third Sunday of January. Celebrated in honor of the Santo Niño, it is the grandest festival in the Philippines. Downtown Cebu is an hour’s drive from the Mactan International Airport, and very accessible by jeepney or taxi from all points in the Metro. fave ko yung guitars mo dito eddie! very CEBUish… sayang lang, mej kulang sa contrast. pero syempre, okies pa rin! clap clap! OH BTW, i have a copy of FUDGE MAG dec07, you’re featured there! congrats!!!! @punky: yeah, the shot is very iconic but was backlighted. oh yes, the lomolokal interview! hope we can go on a lomotrip very soon.